President Trump held an impromptu press conference this week in which he (calmly) excoriated the Mainstream Media. He downgraded CNN from "fake news" to "very fake news". Team Trump rallied across the country and liberals became re-enraged. Transiting MC conjunct transiting South Node: authority (the corporate mainstream press?) plus loss. 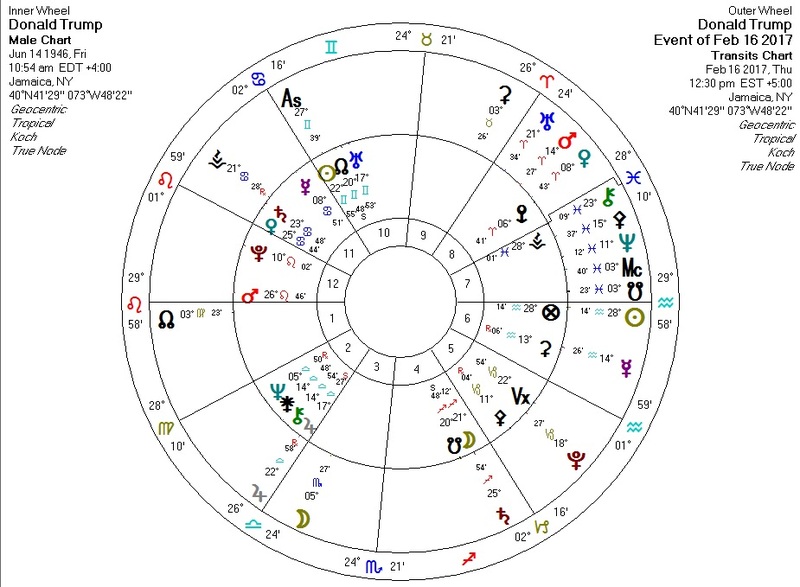 Transiting Sun conjunct Trump Part of Fortune: a fortunate day for the "God Emperor"? Transiting Mercury conjunct Trump Ceres in Aquarius: Mercury is speech/communication, and I find Ceres often active when something is "taken away". Has Trump taken something away from the (Aquarian) mass-media? Transiting Mars opposite Trump Jupiter: is this the start of a public-communications offensive?